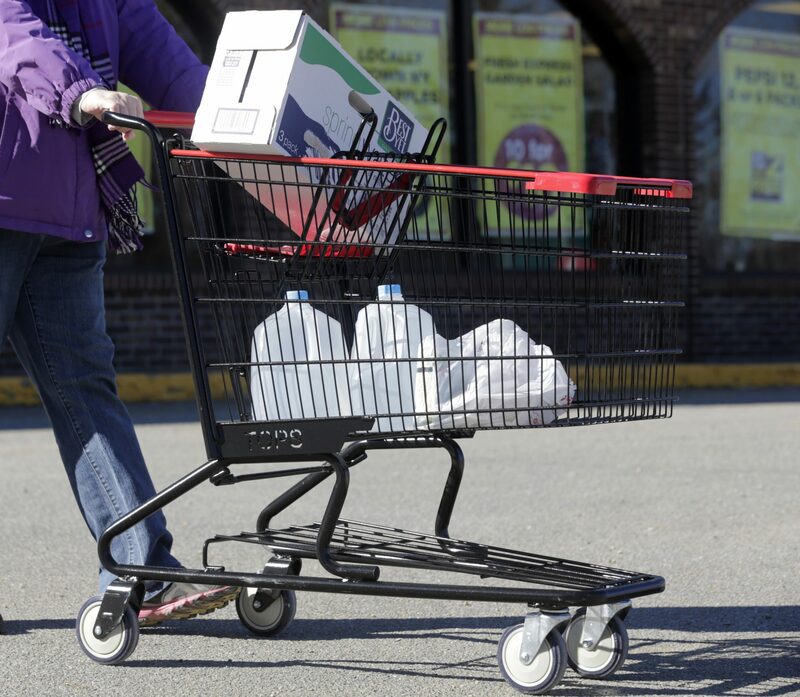 In this Friday, Feb. 26, 2016 photo, a woman leaves a Tops supermarket with bottled water that is being supplied to residents in Hoosick Falls, N.Y. PFOA, long used in the manufacuring of Teflon pans, Gore-Tex jackets, ski wax, and many other products has turned up in the water in factory towns around the country like Hoosick Falls, impacting drinking water. The New Jersey Department of Environmental Protection has taken a step toward cleaning up water contamination from an unregulated class of perfluorinated chemicals known as PFAS. The toxic chemical is used in the manufacture of non-stick cookware, stain resistant clothing and firefighting foam. Although those types of “contaminants of emerging concern” are not regulated by state or federal authorities, research has begun to link exposure to cancer and other illnesses. 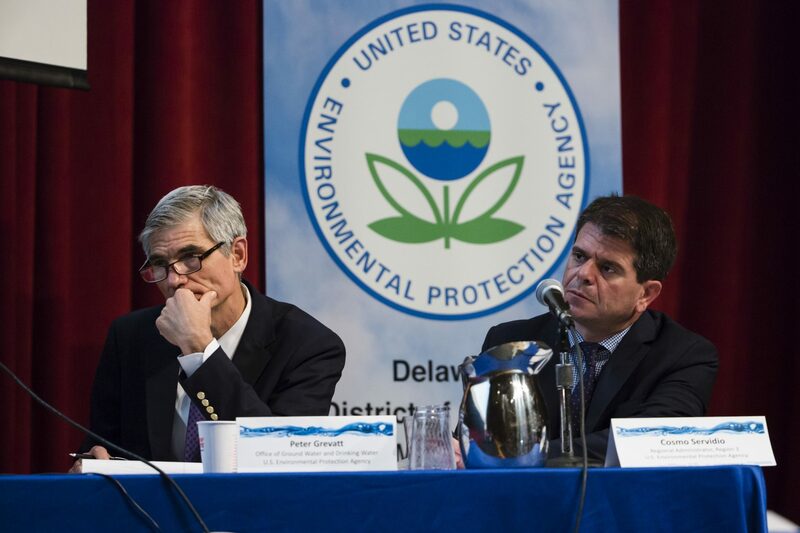 Without federal or state regulations, groundwater polluted with dangerous levels of PFAS is not considered “contaminated,” according to New Jersey DEP spokesman Lawrence Hajna. Over time, groundwater contamination can impact the aquifers that supply drinking water. The DEP proposal would trigger remediation efforts if groundwater contained more than 10 parts per trillion for the chemicals, which include PFOA and PFOS. Hajna says the emerging research points to potential serious health impacts. “A growing body of studies suggest that PFOA, PFAS and other types of related chemicals may impact our liver and immune system function, may increase blood cholesterol levels, and cause delays in the growth and development of fetuses and infants,” he said. Hajna said New Jersey was the first state to start testing for the chemicals in drinking and groundwater sources. EPA tests from 2013-2015 found PFOS in 3.4 percent of New Jersey’s public water systems, which is close to twice the national rate of 1.9 percent. The New Jersey Drinking Water Quality Institute, which advises DEP, has recommended maximum contaminant levels for PFOA at 14 parts per trillion, and 13 ppt for PFOS. Hajna said Gloucester and Salem counties have a number of sites with elevated levels of PFAS. The chemicals don’t break down readily, and so can remain in the body years after consumption. “Even at very microscopic, minute levels, these chemicals can accumulate in our bodies and cause health problems down the road,” Hajna said. New Jersey was the first state to put in place maximum contaminant levels for one of the chemicals, PFNA, in 2018, which allows the state to enforce the standards. But environmental activists say the state is now dragging its feet on implementing regulation for the other related chemicals. Hajna said rulemaking is a time-consuming process. Pennsylvania has just begun to study the issue, but does not regulate PFAS. Nor does the federal government. The shutdown has delayed release of an EPA proposal to regulate the chemicals, which the agency had planned to release at the end of 2018. New Jersey’s DEP will be taking public comment on the groundwater proposal through February 19.